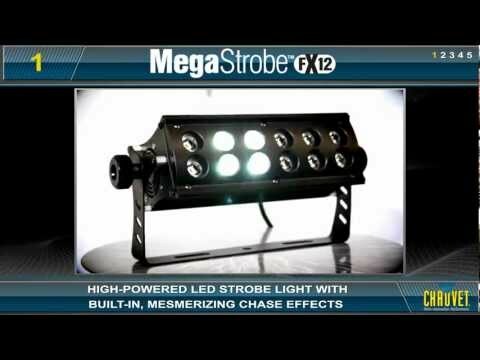 The MegaStrobe FX12 is a high-powered LED strobe light. Lightweight, robust housing permits easy transport and advanced software controls dimming, strobe rate, chases, and operating modes without a controller. Considering purchasing the Chauvet MegaStrobe FX12? Have questions? Ask people who've recently bought one. Do you own the Chauvet MegaStrobe FX12? Why not write a review based on your experience with it. Wow.....what a great little fixture. It is brighter than it looks!!! There are so many things you can do with just a strobe light. It makes every setup look fab and pro at the same time. This is so bright and it is quite cheap!! Well done Chauvet! While this is an expensive strobe it does the job better than any other. I bought one with the aim of eventually buying another, however, placing this in the centre of my set-up has proven to be very very effective! 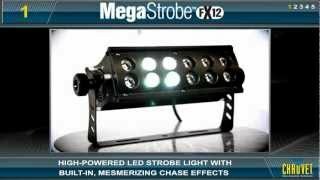 Seen a video for Chauvet MegaStrobe FX12 online or have you own video? Check out Chauvet MegaStrobe FX12 on DJkit.com!